When conservatories are well built they look fantastic, from both an internal and external perspective. They provide you with a wealth of light and space and no matter the design, give you a number of options. So what’s important is to keep the conservatory well maintained. 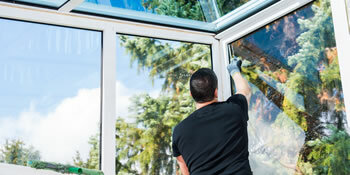 By ensuring the conservatory is regularly cleaned you can avoid any major repairs and costs in the future. Of course, because of the large number of glass panes the chances are dirt and grime will begin to accumulate, not to mention algae. If this is left for too long a number of problems can occur. For uPVC conservatories there can be discolouration, whilst corrosion could occur to metalwork and seals may begin to leak, damaging the efficiency. Whether you have invested a lot of your own money into a brand new conservatory, or have inherited it as part of a property you’ve bought, it’s equally important to keep it in great condition. Ensure the efficiency of your conservatory and stop air leaks. Properties are given an energy ranking depending on how efficient they are and ratings are shown in the data below. This ranges from A, by far the most energy efficient, to G, the least efficient. With a higher rating you're more likely to have less costly energy bills as more heat will probably be retained in the home. It is possible to increase your home's efficiency with insulation including double glazing, loft lagging or wall cavity insulation. There are numerous types of property in the United Kingdom and the info beneath shows the type of housing within Uk. Throughout the country the most common housing types are typically semi-detached and terraced housing, although detached homes, flats and bungalows are also available. The pie chart below displays the percentage of properties in Uk which are central heated and non-central heated. Central heating figures in the the vast majority of UK homes, such as those on the gas grid and properties heated by oil and electric. The information underneath displays the spread of homes heated up by various fuels. Throughout the United Kingdom the most common hands down are gas heated homes, followed by electricity and then oil. Biomass central heating boilers are also growing in popularity, heated by sustainable products such as wood pellets or agricultural waste.|Properties in Britain are warmed by a variety of fuels, including gas, electricity, oil, solid fuel and LPG boilers. Each fuel has a varying cost associated with it which means you can find yourself with cheaper energy bills by changing how your home is heated. Even solar thermal panels are being considered by many people in order to reduce heating bills for the many years to come.